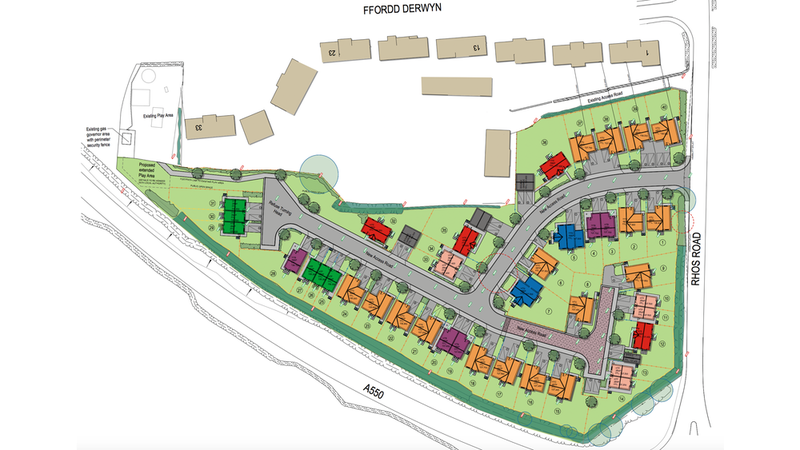 A development of 40 semi-detached and detached 2, 3 and 4 bedroom homes including 10 affordable homes. Approved on appeal in August 2016. Conditions and detailed plan yet to be approved. Currently open to view and comment. The only road access will be onto Rhos Road from a new opening. There will be access through to the Ffordd Derwyn play area. Foul drains will be connected to Ffordd Derwyn under the play area. If you have questions about this development or observations about the site please get in touch with the community council via Alan Wight (alanwight176@gmail.com).